Our website has tons of great new features! You can now request shot records and immunizations, or submit your own form to be completed by us. You can contact us in multiple ways, such as e-mailing the front desk or billing, or by logging in to the portal to ask our triage nurse a question or request a prescription refill. Take a look around to see even more features, and if there are any comments or suggestions you have, do not hesitate to let us know! We want a website that you will enjoy and want to use. Download all forms and send them right to our office from our website. For expecting parents and parents looking for a new pediatrician. Request shot records or physical forms, or submit your own form to be filled out by us. Are you looking for old vaccine or medical records? ​We are proud to be part of the Clinical Alliance Network. CAN gives us a voice, and allows us to bring back the love, passion, and dedication you can only get from your neighborhood pediatrician. 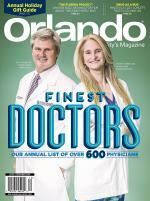 RDV SPORTSPLEX PEDIATRICS has been recognized as one of the top Orlando Pediatrics practices.